Industry leading performance and efficiency. Dell™ rack servers maximize productivity. Dell blades are simpler, faster, cooler. Designed for flexibility and high availability. 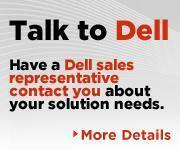 Dell tower servers deliver outstanding price performance. Accessories for your Dell PowerEdge™ servers and for your datacenter. Simplify IT and maximize value with servers that are easier to buy, deploy, manage and maintain. Power, cooling and airflow estimates for servers centers. * Based on a report published by Principled Technologies, commissioned by Dell, “SPECjbb2005 performance and price of the Dell PowerEdge R710 and HP ProLiant DL380 G6” September 2009. *Source: Purchasing Intentions survey, “Virtualization Decisions 2009 Purchasing Intentions Survey,” conducted by SearchServerVirtualization.com and TechTarget Inc. The survey was conducted between June and September of 2009. * Based on VMmark benchmark testing conducted by Dell Labs in June 2009 comparing similarly configured 4-socket, Dell PowerEdge AMD Quad-Core and AMD Six-Core servers. Actual performance will vary based on configuration, usage and manufacturing variability.